The night before Flo Meiler and I meet, 12 gallons of water are pooled in the pole-vaulting pit at Burlington High School. But, by the time I show up, she’s bailed it out and is practicing nimble hop-steps in her green-and-white singlet and briefs. Then, carrying a long white pole, she sprints and arcs up and over a six-foot-high bungee rope. This would look like a normal, everyday track-and-field practice, except for the fact that Meiler is a grandmother of five. At an age when walking up the stairs can be a hurdle, Meiler actually does the hurdles — one of 18 athletics events she not only competes in but also wins, again and again. More than 750 medals, 80 trophies and 150 ribbons are stuffed into Meiler’s home in Shelburne, most of them belonging to Flo — her husband, Gene, is also a competitive athlete. This summer, she won three more golds, a silver and a bronze at the National Senior Games; and then four golds, three silvers and a bronze at the World Masters Athletics Championships — all shortly after turning 77. Baby boomers may be aging better, for the most part, than their predecessors, and plenty of former professional and Olympic-level runners can keep competing until the Grim Reaper catches up. But Meiler didn’t actually start track and field until she was 60. From Champlain, N.Y., she was a competitive water-skier for 30 years, and she met Gene, a former World War II B-52 bomber pilot, at a Rouses Point ski club. After living in Orlando and California, the pair landed in Vermont in 1966. Meiler began competing in tennis in 1991. Meiler’s multifaceted training regimen has paid off not only in medals and many world records, but also in multiple titles: the USA Track & Field Female Athlete of the Year; the Vermont Senior Games Athlete of the Year (1997, 2004, 2005, 2009); and a spot in the USATF Masters Hall of Fame (2010). There’s just one problem. Meiler’s pal Barbara Jordan — the one who encouraged Meiler to try track 17 years ago — has turned 75 and is now in the same competitive age group as Meiler. At the World Masters last month, Jordan (who does not pole-vault) broke a world record set by Meiler in the 200 long hurdles. “I said, ‘I’ll break it again,’” quips Meiler. But the two insist they are very friendly rivals. “We’re like the odd twins or something,” says Jordan of the women’s reception among other states’ senior athletes at large championships. At this point, she doesn’t have to worry about wasting time in a physician’s waiting rooms. “My doctor said, ‘If I had more patients like you, I wouldn’t make any money,’” says Meiler. Meiler sighs, but seems unflustered by the humidity that’s begun to cloak the BHS track. “I’m pretty tough for an old lady,” she says. 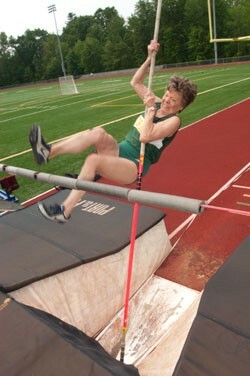 The Vermont Senior Games State Pole Vaulting Championships take place on Friday, August 12, at 9 a.m. at 2476 Ferry Road in Charlotte; the rain date is Saturday, August 13, at 3 p.m. The Vermont Senior Games Track and Field Championships take place Saturday, August 13, at 8 a.m. at South Burlington High School. Anyone who is at least 50 by December 31, 2011, may compete, but registrations for both events must be received by August 8. Fees apply. For more information on these events and other upcoming tournaments, visit vermontseniorgames.org or call Barbara Jordan at 658-4486.